World Cup Soccer 2010 is fast approaching. Thousands of people from around the globe are about to descend on South African shores for the biggest sporting event in the world. Being in South Africa at this time provides you with many travel opportunities to see this beautiful country and all it has to offer. South African Game Reserves provide some of the best wildlife viewing experiences in Africa, and should not be missed. Here are our South African wildlife and game reserve highlights. As the name suggests, the best place to see Elephants in Africa. 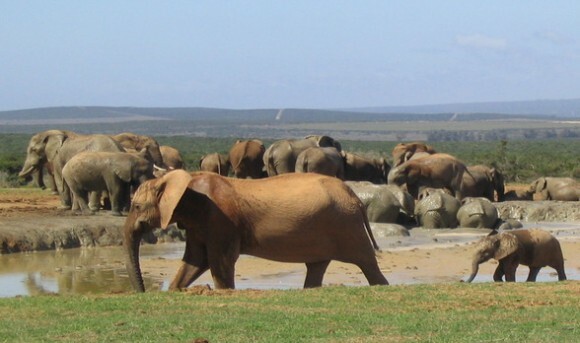 Addo Elephant Park is growing, and is increasing its borders and variety of animals. Apart from running into hundreds of elephants as they go about their day eating, bathing, playing and chasing lion cubs around waterholes, you will see an abundance of antelope, warthog, zebra, lion, buffalo, and rhino. We had incredible elephant encounters at this park, and is one of my most memorable from the whole of Africa. The popular main rest camp of the park offers a wide variety of accommodation units to suit all tastes and budgets with plenty of activities to keep visitors busy. 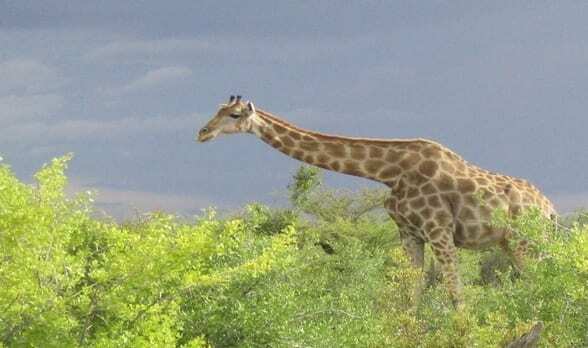 A unique feature is the waterhole lookout point, floodlit at night, within the camp as well as the underground hide, allowing close encounters with wildlife at the waterhole. Addo is about 7okm from Port Elizabeth and opened every day. 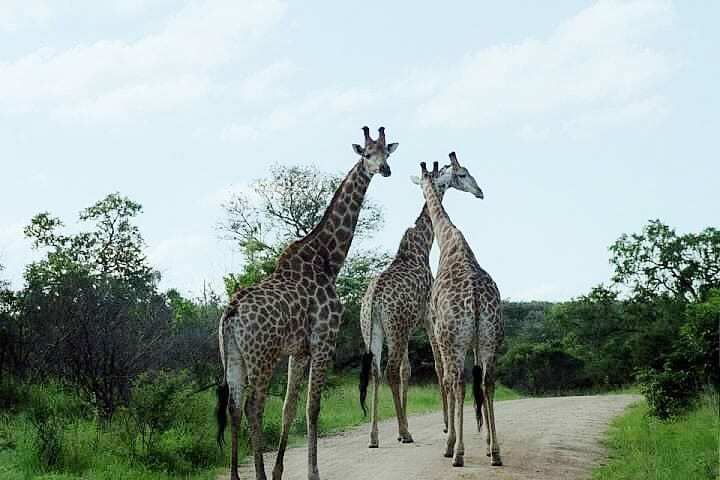 Kruger National Park is well known for having one of the best African wildlife viewing experiences. 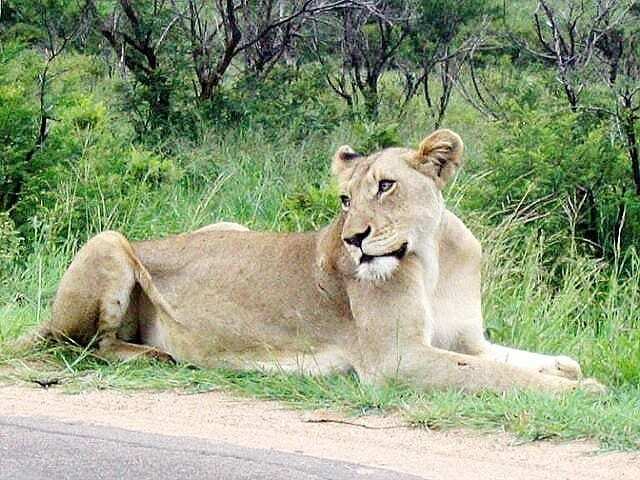 Kruger has all the African wild animals you could ever hope to see. 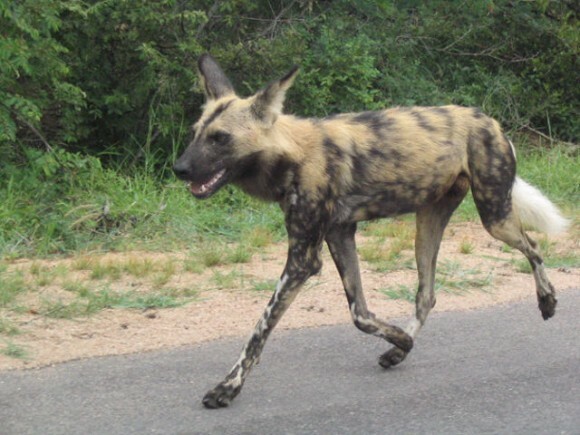 After spending four months backpacking Africa and visiting many African game reserves, we finally, at Kruger, saw two leopards and even the very rare wild dogs. Kruger is massive so choose one area to stay at and base your drives near there. We found the Lower Sabie area to be the best for viewing. Bear in mind though that animals move with the wind. Camping facilities and lodges at Kruger are superb. We found it the best place to take an organized night time safari drive. And if you are a thrill seeker, then I highly recommend a walking safari. Nothing beats walking freely around as a guest in the animal’s kingdom. We came frighteningly close to black rhino, and almost to lions except the big scaredy cats flew off into the distance. Yeah! Who’s the King now?? You cannot miss the opportunity to ride an ostrich. It’s a once in a lifetime chance to create a fun life-long memory. Oudtshoorn is 480km from Cape Town and situated in the Cango Valley. There are plenty of Ostrich farms in the area you can tour. 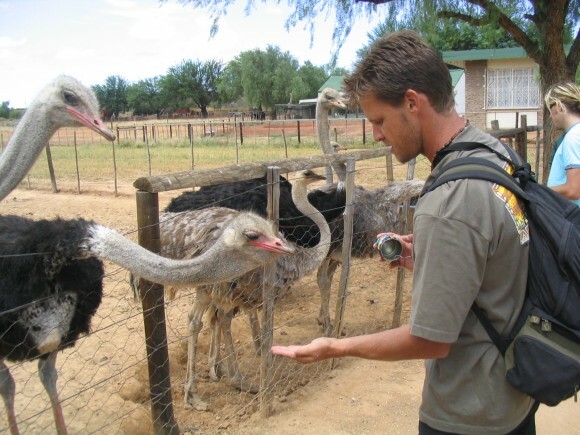 A tour usually comprises of feeding the ostriches, standing on ostrich eggs without breaking them, watching a jockey ridden ostrich race, and then riding one yourself. It really is a unique and hilarious experience. The only disappointment for me, was having the guide holding you and the ostrich; I just wanted the giant bird to have the freedom to take off , hit its full 60km/h stride and give me one crazy memorable ride. 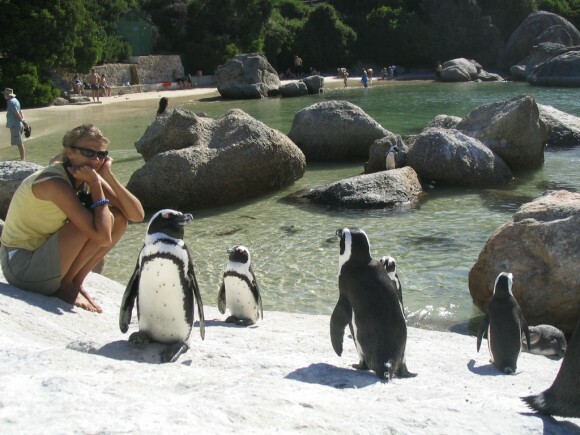 Get up close and personal with a colony of penguins at Boulders Beach, Simon’s Town. You wouldn’t think South Africa would have penguins until you swim in the ocean, and realize that it’s certainly cold enough for them. 2500 penguins live and play on the beach at Simon’s Town and you are allowed to hang out with them. If you are brave enough to swim in the freezing water, you can also play Marco Polo with them. The penguins are unfazed by the tourists sitting amongst them on the rocks and are happy for you to get up close for a photo. Boulder’s is a picturesque beach, with boardwalks for you to walk along to view the mating, nesting, and sunbathing penguins. Simon’s Town is on the Cape Peninsula not far from Cape Town. One of the best ways to experience Cape Town is to rent a car and drive yourself around. it is the best way to see all the beatuiful sights and it is totally possible to get cheap car hire in Cape Town . Totally agree. We hired a car from Cape Town and did the Garden Route, to Jeffrey’s Bay, taking in Addo and then back to Cape of Good Hope. Driving the Chapman’s Peak Drive in CT is worth the car hire alone. We also hired one from J’burg to go to Kruger. South Africa has the cheapest car hire in South and East Africa. Do you still have the information for your car hire from Jo’Burg to Kruger? Ah, bush breaks are always the best! Save more on car hire & also accommodation, contact Flight Centre! Great blog! Love Addo, and have not found a place where you will have more consistent elephant sightings. It’s a must see!! Ah! you made my day with Boulders Beach! I’m crazy about penguins so would love to get up close with them at the beach (ha, out of context that sounds so surreal)… penguins and monkeys are my two favorite animals. One of my favorites is also Pilanesburg National Park. If you can’t make it out to Kruger, it’s a short drive from jo’burg. The game is just as great. Had the best lion sighting ever there. It’s these kinds of posts that make me want to plan my next trip when I’m only half way through my RTW. Africa was a bit out of my budget so I chose India but it looks like I’ll need to start saving as soon as I et back. I’ve found Africa to be quite inexpensive once you are there. But getting there…that’s where you lose the savings you gain in-country. One trip to Africa will change you. Africa is really cheap once there. Africa gets under your skin that is for sure. We love it!